Many YouTube fans might look for an easy and quick way on how to download YouTube music to iTunes, so that they can play YouTube music on iPhone, iPod or iPad. If you are one of them, the post is just right for you. In this post, we will show you how to download free music to itunes from youtube for offline enjoyment. Here are three pieces of software recommended for finishing the task. To download music from YouTubes to iTunes, you could get help of the powerful music recording software. With Leawo Music Recorder, you are able to directly download music from YouTube by recording and share them to iTunes within one click. The following guidance will show you how to download music to itunes from youtube by recording music with Leawo Music Recorder. 1. After kicking it off, click the “Audio Source” icon on the main interface to set audio source firstly. 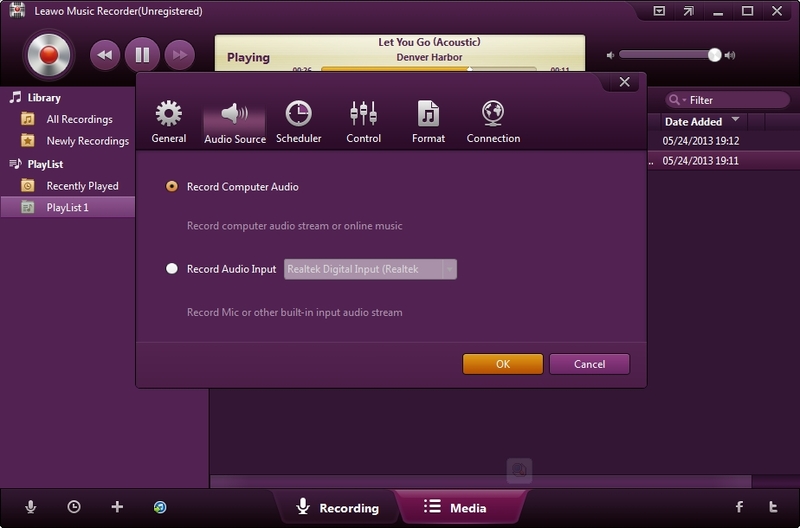 To record online audio and record streaming audio, select “Record Computer Audio” option. 2. To start recording, hit the big red “Start” button at the top left corner. And then click to play YouTube video. It should be noted that you first let this music recording software start recording and then play your source audio. Also you can set the timer to record audio. Click the second icon at the bottom left corner to enter the Recording Task Scheduler and set the timer. 3. 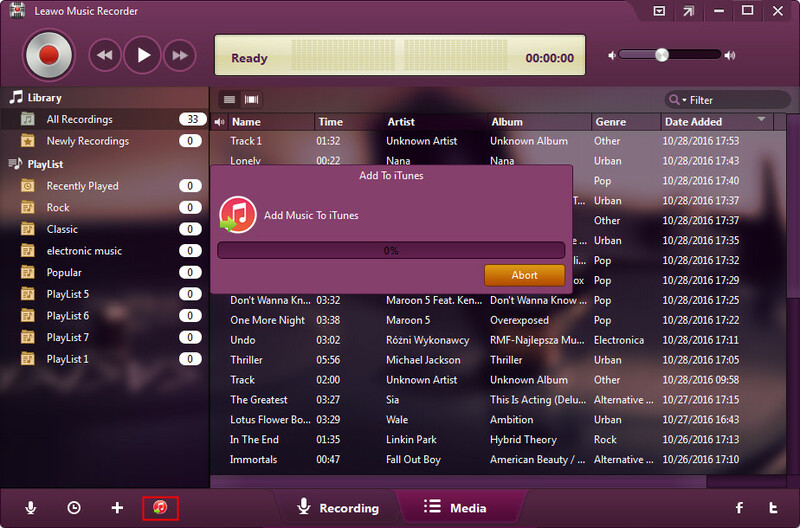 For music fans the Leawo Music Recorder has a very useful feature. 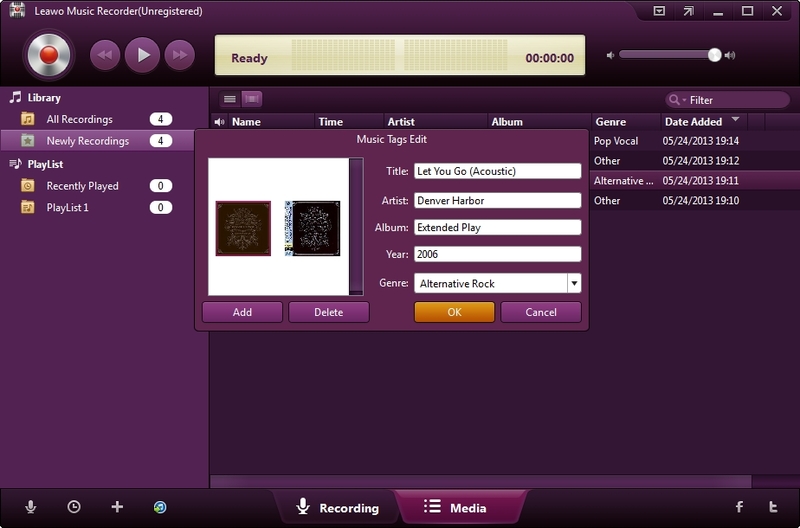 It could automatically search, download and add music tags to your recordings. But you are allowed to edit the music tags manually. In the “Media” section, you can check out all the recordings in the “Library“. And then you can right click a recording, choose “Edit Music Tags” and edit the music tag by yourself. 4. After recording all the music you want, select the music files in the “Library” tab or press “Ctrl” to select multiple songs. And then click the “Add to iTunes” button shown as arrow icon at the bottom of the main interface to add the recorded music to your iTunes library. In addition to recording audio from YouTube and add them to iTunes, you could also download music from YouTubes to iTunes by downloading audio from YouTube with YouTubes downloading software and use Leawo Video Converter convert audio to iTunes supported audio file like MP3, WAV, AAC, etc. 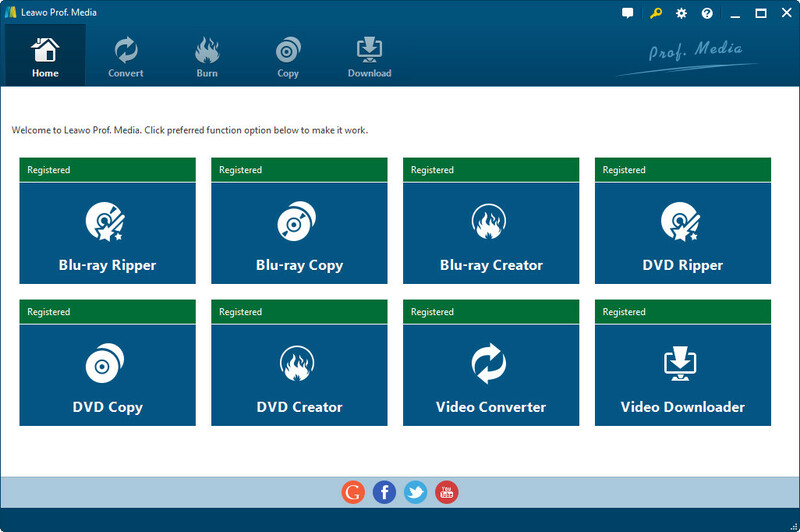 As Leawo Software has integrated Leawo Video Downloader and Leawo Video Converter into Leawo Prof. Media, we can download and install Leawo Prof. Media to complete the process. The following guide will show you how to download YouTube music to iTunes by with Leawo YouTube Downloader and Leawo Video Converter. 1. Download and install Leawo Prof. Media on Leawo’s official site, open it and you would find that Leawo Video Downloader and Leawo Video Converter are both included in Leawo Prof. Media. Run Prof. Media and click Video Downloader tab to open Leawo Video Downloader. 2. After clicking Video Downloader tab, the built-in web browser in the video downloader would take you to YouTube by default(Can be changed to any website you want in Settings). To go to other website just click the address bar at the top and input the new address. 3. Open the link with the video you want to download and the video downloader would detect the downloadable video source automatically. 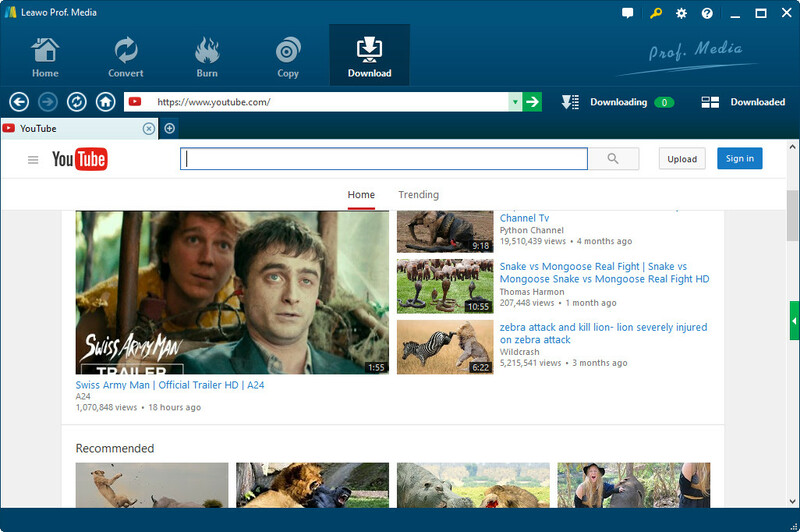 When it finishes detecting, all the downloadable video sources would be shown on the sidebar on the right. If the sidebar didn’t come up when you open the video link , just click the green button in the middle of the scroll bar with a leftwards triangle on it to call it out. On the sidebar you could see all the downloadable video source with detailed information like the format, resolution and size of the video. Click the Download button on the video you want to download to start downloading the video. Because you want to download audio only, you need to choose the “audio only” format to download. 4. Check out the downloading audio in the Downloading tab next to the address bar, when the video finishes downloading, check it out under Downloaded tab. 5. Under “Downloaded” tab, right click the downloaded video and choose “Add to Convert” to add downloaded video to Leawo Video Converter for converting video to iTunes audio file. 6. Click the drop-down box next to the “Add Photo” button to select “Change” option, and then select “MP3″ as the output format on the popup Profile window. Click the big green “Convert” button on the sub-menu bar next to the format setting drop-down box. Then, on the popup sidebar, set output directory. After setting output directory, click the “Convert” button right below. Leawo Video Converter would start to convert video to iTunes audio immediately.